Thisbeciel posted these quite some time ago, but I have been putting off posting them here. It is a good time to add these to the other footage and screencap posts from a few months ago (one more). The 1952 production is extremely rare. The production stars Katherine Bard as Jane Eyre and Kevin McCarthy as Mr Rochester. For my thoughts on this production see the posts here. 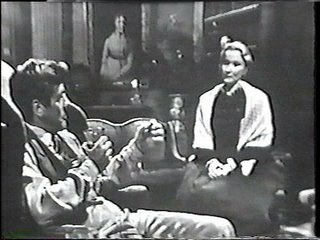 She has also uploaded all of Jane Eyre 1934 with Virginia Bruce as Jane Eyre and Colin Clive as Mr Rochester. This production is currently in the public domain. It is the acknowledged failure of all Jane Eyre adaptations, but I think it does have some charm even though it often only barely resembles the story at all. Mr Rochester has a faux air of Mr Darcy, I think, and Adele sings and falls into vases. See? It isn't all bad! It is often quite funny, actually. Image is of Katherine Bard and Kevin McCarthy in Westinghouse Summer Theater One's Jane Eyre from 1952. ETA: I have corrected some of the dates. When I first posted this, I wrote '1943' each time I meant '1934'. Thanks to an anonymous reader caught the error.